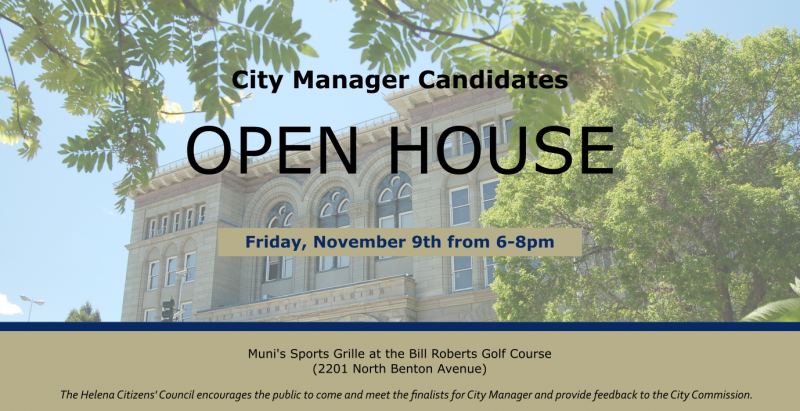 The Helena Citizens’ Council (HCC) invites the community to an Open House where attendees will learn more about the City Manager search process, meet the candidates, and provide feedback to the City Commission. Each candidate will provide a brief introduction, followed by an opportunity to meet and interact informally with attendees. The City Commission will be interviewing the candidates on Saturday and Sunday, November 10 and 11. The HCC is an elected body composed of 4 representatives from each of 7 neighborhood districts. The HCC is established by the City Charter and advises the City Commission.